Ionic liquids (ILs), usually consisting of a large organic cation and a small inorganic polyatomic anion, have attracted considerable attention in recent years due to their unique thermophysical properties. The low vapor pressure and high conductivity of these molten salts combined with highly tunable properties, have resulted in highly diverse applications across many different fields in chemistry, materials science (battery electrolytes), chemical engineering (gas sorption and purification), and many more. To calculate thermodynamic properties of ionic liquids with COSMO-RS, the IL may be described either as a single ion pair or as discrete cations and anions. The latter method will be mainly used here. The COSMO-RS ionic liquid database ADFCRS-IL-2014 contains 80 cations and 56 anions. This ADFCRS-IL-2014 database consists of ADF COSMO result (.coskf) files, from standard ADF quantum mechanical calculations, as described in tutorial 1: COSMO result files. The user can create new anions and cations using that same approach and add them to the List of Added Compounds. The ADFCRS-IL-2014 database is part of the ADFCRS-2018 COSMO-RS database. Install the ADFCRS-2018 database if it is not yet installed, see tutorial 4: The COSMO-RS compound database. SCM gratefully acknowledges Prof. Zhigang Lei’s research group (State Key Laboratory of Chemical Resource Engineering, Beijing University of Chemical Technology, China) for providing the ionic liquid database, the corresponding tutorial, and the reparameterization of COSMO-RS for ionic liquids (ADF Lei 2018). In Ref. Han, Lei and coworkers present a reparametrization of COSMO-RS parameters for ionic liquids within the ADF framework. The extensive training set consisted of 2283 activity coefficient data points at infinite dilution and 1433 CO2 solubility data points that were collected from literature references. However, in this Tutorial we will use the original COSMO-RS parameters. Ionic liquid densities may be estimated from the molecular volume and molar mass (MW) of the constituent cations and anions. The COSMO volume is stored in the coskf file and is displayed, together with the MW, when a compound is selected in the COSMO-RS GUI. Volumes and molar mass of other cations and anions can be similarly found. Data for a few compounds are listed below. As can be seen from this table, the calculated densities are systematically overestimated by approximately 15%. Thus, the COSMO volumes underestimate the volume of a single compound, if they are used for estimating the liquid densities. The activity coefficient of a compound i solvated in an ionic liquid is an important thermodynamic property. The cation and anion, which have been treated separately, will be used in equal amounts to ensure an electroneutral mixture in the COSMO-RS calculation. In other applications cation-anion pair have been treated as one molecule, however, in the COSMO-RS calculations below we will treat the cation and anion as two separate molecules. This has consequences for the value of the activity coefficients. Thus in this case we should scale the activity coefficient at infinite dilution γi tern , which is directly obtained from the COSMO-RS calculation, with a factor of 0.5. 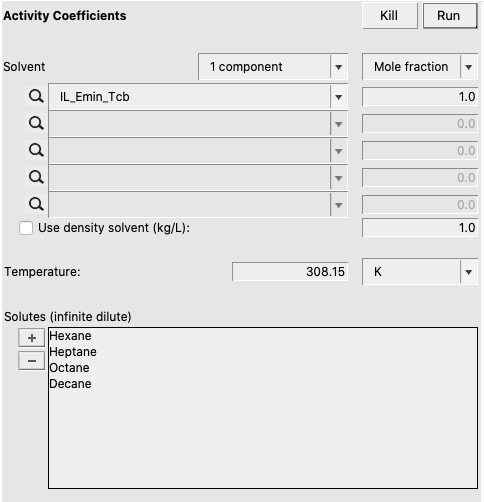 If one does not supply a density of the solvent in the input, the program calculates the density of the solvent by dividing the mass of a molecule with its COSMO volume. Note that the calculated activity coefficients do not depend on this density. The result of the calculation is given in the form of a table. Note that for a comparison to experimental numbers, the calculated activity coefficients have to be scaled with 0.5, as was discussed before. In the next figure the results of the calculated activity coefficients at different temperatures are compared to experiment. In this figure activity coefficients at infinite dilution of n-alkenes in [EMIM]+ [TCB]- are shown for different temperatures ranging from 298 K to 358 K. The scattered points are experimental data from Ref.. The points that are connected with a line are calculated numbers with ADF COSMO-RS. For example, for Hexane, the calculated values T = 308.15 K are: 1000/308.15 = 3.245, ln(0.5*63.8579) = 3.46.
where Hi is the ratio between the partial vapor pressure of a compound i in the gas phase and its molar fraction in the liquid phase, \(\gamma_i^\infty\) is the the activity coefficient of the compound at infinite dilution, and Pi S is the saturated pure compound vapor pressure of the gas. The familiar Antoine and Wagner equations can be used to calculate the vapor pressure below the critical temperature Tc , if one knows the coefficients. Above Tc , they can be extrapolated as a hypothetical vapor pressure. If the experimental saturated vapor pressures of a gas is not available, then it can be estimated by COSMO-RS. 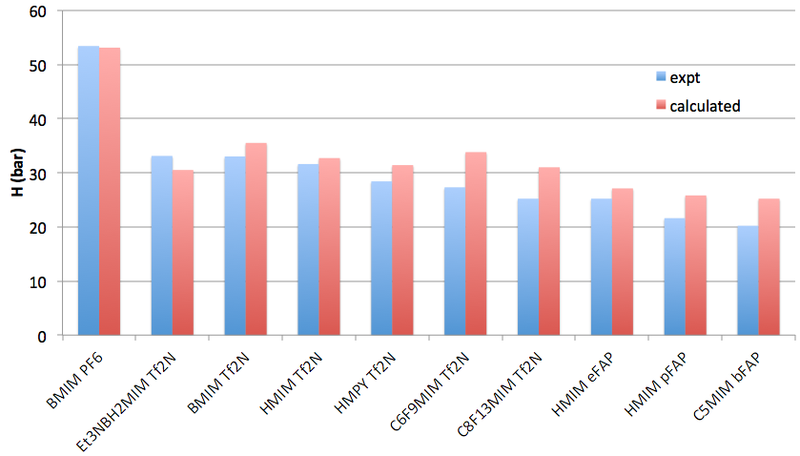 The activity coefficients of infinitely diluted carbon dioxide in [HMIM]+ [Tf2N]- will now be calculated. The results of the activity coefficients. where Vsolvent is the molar volume of the ionic liquid. If no densities for the cation, anion, or solvent are given, COSMO-RS will use the COSMO volume for calculating the molar volume of the ionic liquid, which is 0.2735 L/mol (=(241.00+213.17)*0.6022/1000) for [HMIM]+ [Tf2N]- , if the usual convention is followed, that a pair of a cation and an anion is treated as one molecule. Thus in this case H = 1.01325/(0.1134 * 0.2735) = 32.7 bar, where a conversion factor from atm to bar is included. Note that kH does not depend on whether one treats a cation and an anion as separate molecules, or if a pair of a cation and an anion is treated as one molecule. H = kH,inv px does depend on this definition. P.G.T. Fogg and W. Gerrard, Solubility of gases in liquids: A critical evaluation of gas/liquid systems in theory and practice, New York: John Wiley & Sons, Inc., 1991. 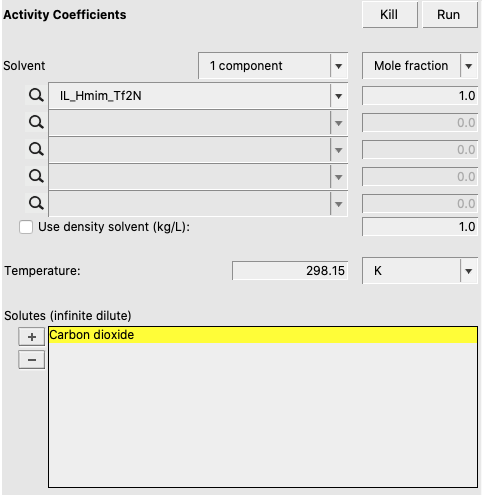 In this example the solubility of carbon dioxide in ionic liquids is calculated and compared to experimental data. First we use the experimental Antoine coefficients for CO2 . 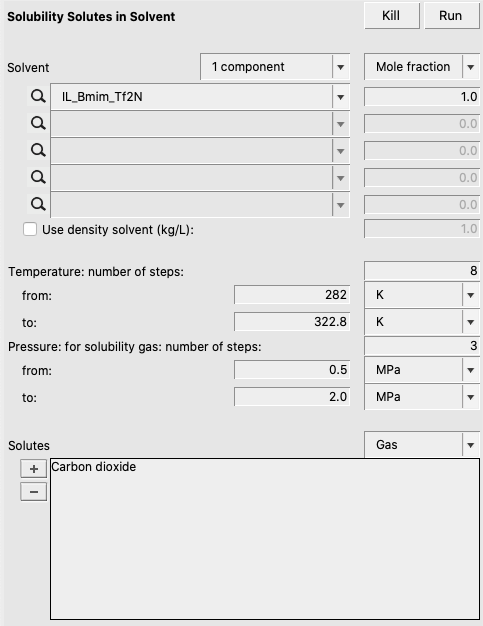 Next we calculate CO2 solubilities. 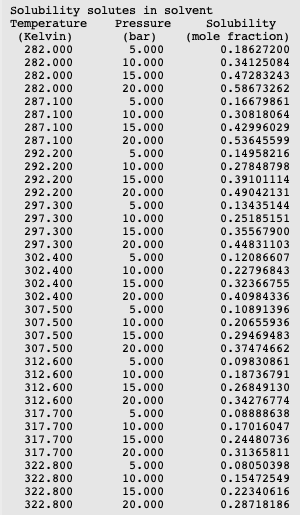 From the results we will use the calculated mole fractions at 282.0 K, 297.3 K, and 322.8 K.
In this example we also calculated the solubity of carbon dioxide at relatively high presures. In this case, for more accurate results, we also need to take the nonideal behavior of the gas into account, the gas fugacity. Note that these values are only approximate, and certainly not applicable for higher pressures. 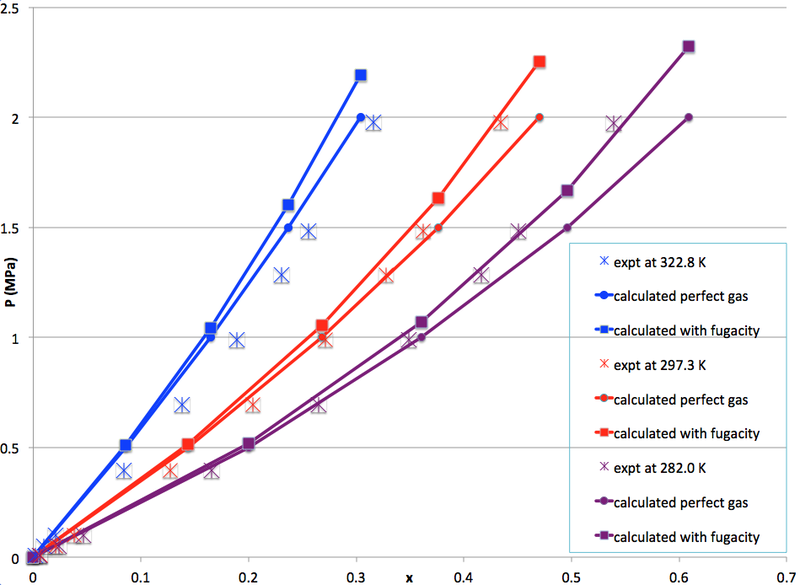 We can use the same solubilities as calculated before but plot them agains fugacity instead of pressure. 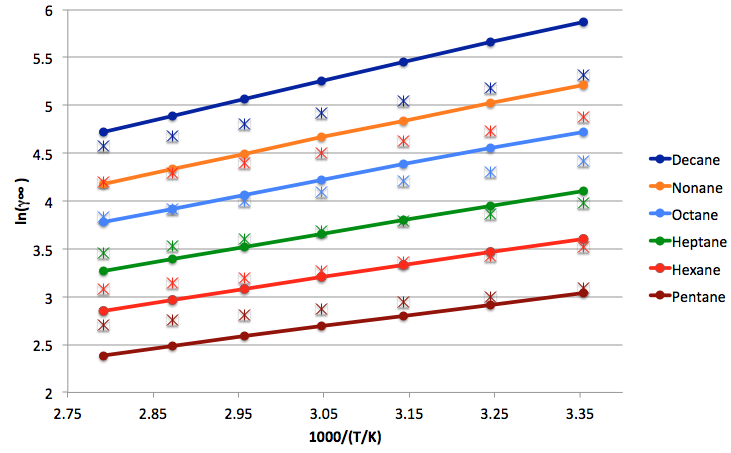 The results can be compared with experimental values fromRef..
For low pressures \(\Phi\) (T,P) will be close to 1. Calculating Henry’s law constants has been described in COSMO-RS Tutorial 6.4, and following this procedure for CO2 in [HMIM][Tf2 N], results in H = 2.242 MPa at T = 282 K, H = 3.204 MPa at T = 297.3 K, and H=5.5222 MPa at T = 322.8 K.
where Si/j is the selectivity between gas i and j in ionic liquids; Hi and Hj are Henry’s law constants of gas i and j, which can be calculated using the methods as described in the COSMO-RS Tutorial 6.4. 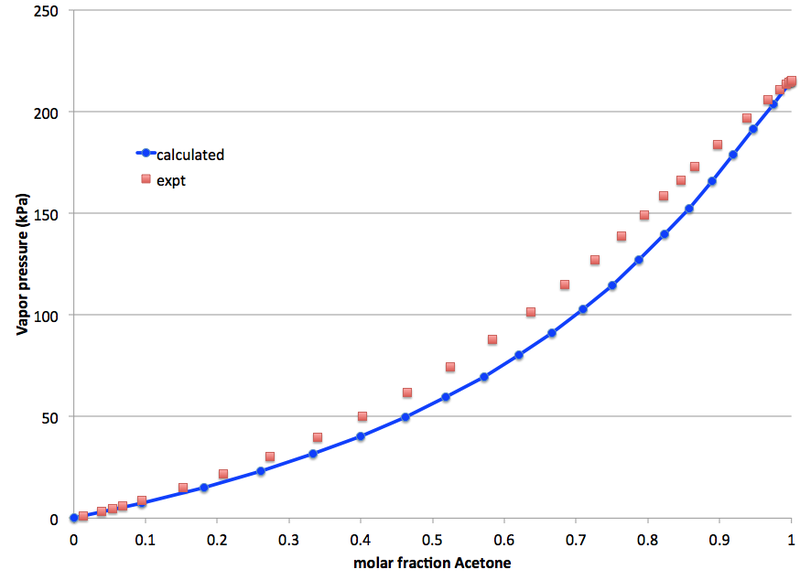 In this example a vapor-liquid diagram of Acetone in [EMIM][Tf2 N] at 353.15 K is calculated and compared to experiment. The experimental saturated pure compound vapor pressure is used for Acetone.